On August 1, 2015, members of a newly-formed group Forgotten British Heroes Campaign held a wreath-laying ceremony near Trafalgar Square, London, in remembrance of Jewish terrorist attacks on British servicemen, Crown servants and civilians in British occupied Palestine in the late 1940s. The wreath-laying ceremony was followed by an indoor meeting and film show in West London. The meeting was addressed by Jez Turner ofLondon Forum, Peter Rushton, assistant editor Heritage and Destiny magazine and Lady Michele Renouf, director of Telling Films. The ceremony recalled the following victims of the Jewish terrorism. 1. 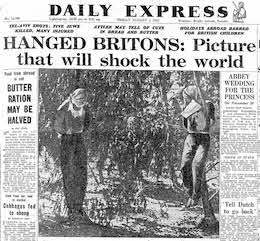 The two 20-year-old British Army sergeants, Mervyn Paice and Clifford Martin, who were kidnapped in Palestine by Menachem Begin (latter prime minister of the Zionist entity), head of the Irgun Jewish terrorists, and then on 31st July 1947 were hanged with piano wire in the eucalyptus groves at Netanya. Their bodies were booby-trapped in the hope of killing those who came to cut the bodies down (see picture on top). 3. The murder by parcel-bomb in May 1948, in Britain, of Rex Farran, brother of Captain Roy Farran DSO, MC – an SAS anti-terrorism specialist. Rex opened the parcel addressed to “R. Farran” at the Farran family home. 4. Tthe murder of Walter Edward Guinness (Baron Moyne) DSO, and Bar, Secretary of State for the Colonies, and his British Army driver, Corporal Fuller, on 6th November 1944. The hand-gun assassinations were carried out in Cairo by the Lehi (also known Stern Gang) Jewish terrorist group. 5. The massacre of Arab civilian villagers at Deir Yassin, Palestine, in a combined operation by the Irgun and the Lehi on 10th April 1948 – killing 100 villagers half of them women and children. On the day, a letter was delivered to the Israeli Ambassador in London, Daniel Taub, recollecting the details of the above and other Zionist crimes which continue until this day, and demanding, among other things, that Israel pay compensation to the families of the victims of Jewish terrorism, build a ‘Museum of Zionist Terrorism’ in Jerusalem and institute courses about Zionist terrorism in Israel’s schools as a warning to future generations. The letter was signed by Martin Webster, Richard Edmonds, Jeremy Turner, Lady Michèle Renouf, and Peter Rushton.